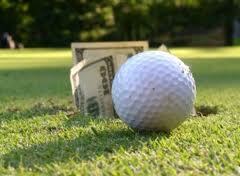 The Scotch Game is golf’s most popular gambling game played on every golf course every weekend. A scotch game is played with four players (two players on each team). Each player plays their own ball out and are awarded points for certain aspects or situations (such as closest to the hole or having the low score on the hole) at the end of each hole the teams add up their accumulated points. If team one wins one point and team two wins two points, team two would be awarded one point. The points cancel each other out. So if your team wins one point for prox, and the other team wins one point for birdie, then the score would be zero on that hole because each team won one point. On the flip side, if team 1 won total for two points, and team 2 won one point for the prox, team one would win 1 point for that hole. When playing in a Scotch game it is important that the team with the most points tee off first on every tee box regardless of regular honors. The team with the most points always has the honors in a Scotch game. 5 point scotch game VERSION 1: The five point scotch game has five points total on each hole. One for low ball (lowest score on the hole), one for total score (the teams combined score), one for prox (closest to the pin in regulation), one for putts (the team with the lowest total putts), and finally one for birdie (any player on a team to make birdie wins this point). There is a total of five points, if two players one from each team were to both make a par, and that was the lowest ball (or lowest score on the hole) then there would be no points for low ball. 5 point scotch game VERSION 2: a variation of the 5 point scotch game is to play with five points total. Two for total, one for low ball, one for prox, and one for birdie. All points work out to the same multiplier, but there is no putting point (this is the least favorite point of scotch players). 6 point scotch game: another variation where teams compete for 6 points per hole. Two points for total score, two points for low ball, one point for prox, and one point for birdie. Win all six and you earn double. 7 point scotch game: two for total, two for low ball, one for prox, one for scramble (miss the green and get it up and down for par), one for birdie. Not as popular of a game as 5 or 6 point scotch game, but I have seen people play this. Normally the 7th point (the scramble) does not effect the blitz. Meaning that if there was no scramble on the hole, and your team won the other six points, you would still get double points (6 for 12). If you got a scramble as well as the other six points, you would get double points on the scramble as well (7 for 14). Blitz/Umbrella: A blitz or umbrella means that if you win all the possible points on a hole your points are doubled. This means that if you win all 5 points in a 5 point game you get double points on that hole. So your five point win turns into ten. Some people even play miracles, where if both players on a team were to birdie the same hole, and win all five points, they would get a double multiplier. Meaning that their 5 point win would turn into 10, and then 10 into 20 for the double birdie. Press: Everyone knows what a press is. Your standing on the tee, you are losing the match or down points, a press is a way for you to double the bet on the next hole, and the points are automatically doubled. Typically the press comes off after the hole, some players keep it on for the rest of the nine, others keep it on for the rest of the match. Just make sure your playing partners know when the press comes off. Only a player that is down, can press the hole. A press can be put on after the team that is winning hits. Meaning that if a player from the winning team hits a ball out of bounds, the losing team can press the hole after seeing the winning teams player jack one out of bounds. Game Press: this is a press that typically stays on for the rest of the nine and sometimes for the entire game. A game press means that every hole is now pressed and worth double points. A game press does not eliminate a regular press, but typically if you have a game press on, then your regular press is only valid for one hole. Only a team that is down can press the hole. Each team gets one game press per match, and it can only be used when they are down (if you are never down points, then you would not be able to game press). There is also something called a courtesy game press, which means that if a team is way down, and they have already used up their game press, you can ask for a courtesy game press, which is typically on the last two or three holes, to give a losing team a chance to come back. Press – Repress: When a losing team presses, after the winning team hits, the winning team has an option to repress a hole after the losing team hits. This means that team one hits first because they are winning and both players end up in the woods off the tee. So team two presses and then both hit their tee balls into the woods. Team one now has the option to repress the hole. A repress means that the hole is now doubled twice. This means that if two points are won on this hole the multipliers work like this: two points turns into four (this is the first press), and then four points into eight (this is the repress). As you can see the points can get up very high with a press repress game. Also a blitz would add another multiplier. So a blitz (a team winning all the points on a hole) could turn out as six points for twelve, twelve for twenty four, twenty four for forty eight on a blitz with a press and a repress on a hole. High Man Blitz Blocker: At a club on the south side of Chicago (Midlothian CC) they play a version of the high man blitz blocker. The only way a blitz can occur is if the highest score on the hole is not tied or had by the team with the birdie. For example: Team 1 A and B players, Team 2 C and D players. 1A makes birdie with the prox and qualifies for the blitz in any other game 1B makes 5. 2C makes par, and 2D makes bogey. So without the high man blitz blocker team one wins all points, and receives the blitz. BUT with the High Man blitz blocker team one had a bogey which tied the high man for the hole, therefore there is no blitz. In order to receive a blitz team one would have had to make a birdie and a par, while team two had a par and a bogey. This is a great way to keep the game lower, and much tougher for blitzing. Keep/Take: Keep take is a means for adding more points to your scotch game. You earn one point for keeping points on a hole and two points for taking. This means that on the first hole Team 1 wins two points (one for prox, one for low ball) and Team 2 receives zero points. On the second hole Team 1 wins two points for total score, and Team 2 receives zero points. When playing keep/take Team 1 wins an additional point on the second hole for winning points on the previous hole or keeping points. If Team 2 were to win points on the third hole they would receive a bonus two points for taking points from Team 1. On the flip side on the fourth hole if Team 2 were to win points they would get a bonus for keeping, and if Team 1 were to win points on the fourth hole they would receive a bonus two points for taking. If the players were to tie a hole then there is no keep/take points on that hole and the next. You only get the keep point bonus if you win points on the previous hole, and you only get take points if your opponents won points on the last hole. Keep/Take does require some good math skills, and an abacus can come in handy. I find that Keep/Take is for the truly degenerate gamblers out there. Eagles/Miracles: When a player makes an eagle on a hole you would think that there is an additional bonus or blitz. I call a win with all points on a hole with an eagle a Miracle. Miracle fits because one would really need a miracle to win all points on a hole with an eagle. This happens sometimes on par 5’s, and it is always an argument when an eagle is made and players are not sure what the bonuses are (besides making an eagle). I like to play where an eagle is just a bonus point and all other multipliers are still in effect. So in a 6 point game where a player makes eagle and the prox, and low ball and total for all 6 points, the eagle counts as a bonus point, and then those points are doubled. So an eagle would be 6 points + bonus point x 2 or 7 for 14 points on a hole. This seems to be the most fair for players, and don’t sweat it too much..you did just make an eagle. These are the basic forms of a Scotch Game in Golf. Each club or group of guys might have a tweak on how the blitz or umbrella work. Players can play for different amounts that each point is worth. It gets really crazy one one half of the team are playing $1 a point and the other half of the game is playing $.05 a point (meaning player a on team one plays player c on team 2 at $1 a point, while player B and Player D play for $.05 a point). What each group plays for is up to them, but be sure that it is a friendly game. No amount of money should ever deter you from playing golf with friends, and if they are not your friends, you probably shouldn’t be gambling with them. The scotch game is the end all be all of golf gambling games. I hope that this little article clears up some of the lingo, and will give your Saturday morning golf game a little kick start. If the scotch game doesn’t do it, then the picture should. Good Luck and may your Blitz be big, and your free drinks be plentiful!